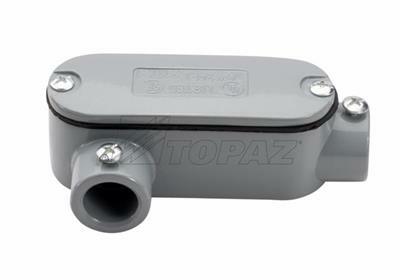 Topaz’s EMT set screw LR type Conduit Body, with Cover and Gasket is manufactured from copper free aluminum. 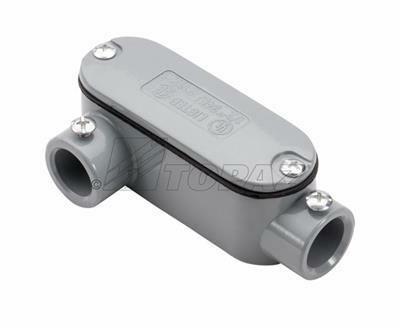 Available in sizes from 1/2” to 4”, LR type conduit bodies permit 90° right bends in conduit systems, provide easy access for splicing and can correct and change direction of conduit runs. Roomy interior allows for maximum wiring space, smooth, rounded integral bushings in hubs offers protection for conductor insulation. 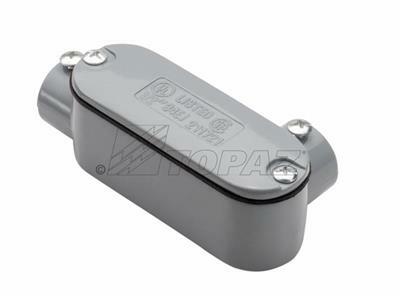 Excellent ground continuity and corrosion resistance; lightweight aluminum construction; domed cover provides extra wiring space; watertight gasket ensures weatherproof installation. UL listed.